When I was pregnant with Ian, I subscribed to all sorts of baby related newsletters and emails and who knows what else. Due to a combination of laziness and, well, laziness, I have yet to unsubscribe from them. So now I am greeted each week with a new email (or two or three) about Ian’s development… yes, even though he’s no longer in utero, they continue to send development emails. Some are interesting, some ridiculous. The most recent one I received- it was ridiculous. The message was about readiness signs (well behaved while eating at home, listens to instructions, able to keep quiet, etc) and doing test runs to ensure you and your kid are prepared. It seemed a little over the top, not to mention the timing struck me as odd. My kid is over 2 years old, and the email is assuming that I’ve never taken him to a restaurant? Ian was roughly 5 weeks old when we went on his first trip to a restaurant. He slept in his car seat the whole time, waking once or twice to eat. And he’s been to restaurants countless times since then. 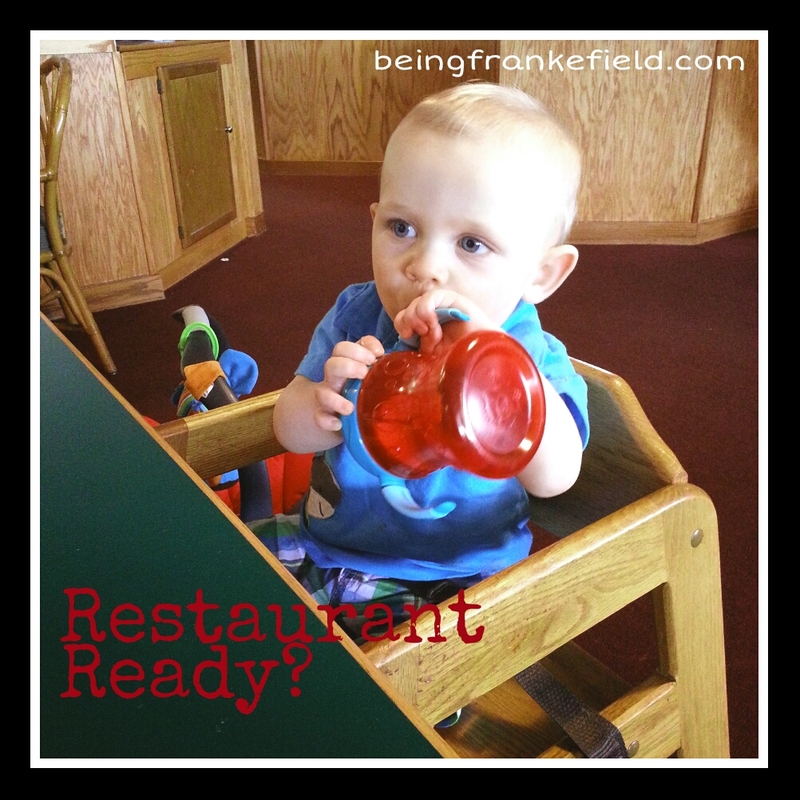 Even when he was newly mobile and fidgety, we took him out to eat with us. Why wouldn’t we? If not, then we’d have to hire a sitter every time we wanted to go to a restaurant? Or else not go to restaurants at all? We like to eat out a few times a month (sometimes more), so that really wasn’t an option. And, frankly, it never occurred to me to NOT take him. How else would he learn proper dining-out behavior? And you know what? It’s never been an issue. Has he had his moments while we are out to eat? Yes. Have we had to take him away from the table to have a “talk” and for disciplining? Yes. But on the whole, we’ve had very few problems. And let’s remember, he is a kid. That’s bound to happen. We just make sure to pick “kid friendly” restaurants (places that aren’t swanky, that are naturally louder, etc) and we try to avoid eating out when he’s already in a difficult mood. So, tell me, am I crazy here? Am I the only one who has taken my kid out to a restaurant prior to age 2? I’m not saying that we take the twins out to restaurants all the time, but we don’t limit ourselves to only eating at home. That email that you got is cra-cra (and I think we subscribe to the same ones). I took boy #1 to the restaurant all the time…as the children multiplied, it pretty much stopped happening though 🙂 Maybe I’ll start up again, with just like 2 at a time. LIke you said, there is no better way for them to learn proper restaurant behavior then taking them out! I can understand the hesitation with multiple kids…we aren’t there yet, but with baby #2 arriving in May, we’ll certainly be facing that situation soon! !